When Christmas is approaching, the rush to both buy quality Christmas presents at the same time make them personal enough so that the receiver actually can benefit and enjoy the gift. I have made TONS of reviews of all of these products, and probably researched over 50 products in each category AT LEAST, and these are the top tear products from every product category of gifts that could be a great Christmas present for someone suffering from back pain. All product links take you to Amazon.com and, by clicking, lets me earn a small commission. I will en the article with a specific category of products that I advise you not to buy because it can result in misinterpretations and misread implications. A Back massager cushion is designed for a complete back massage, but most of them also cover the neck and shoulders. So if you’re looking for something that gives quality massage on an everyday basis without spending a lot of money on massage therapists, a back massager cushion is a great option. There are a vast variety of options, but I will only suggest the one I most highly recommend to buy as a Christmas gift. It’s the Zyllion ZMA14 Shiatsu Neck & Back Massager Cushion that you can buy from Amazon.com. Zyllion is a well renowned and recognized company for producing a vast variety of massage products. Their products are all FDA listed, which means that all aspects of the manufacturing and testing are accepted and backed by the FDA guidelines. Kneading, vibration, rolling, this unit covers all of this. Moreover, it is highly adjustable, so you can easily find your specific weak spot. Additionally, there’s built-in heating for the bottom pad, and it also includes neck massage. A nice touch on this back massager cushion is that the massage nodes are of different sizes, resulting in a much more authentic feeling. The main and most used setting is the “Shiatsu” variant, that is supposed to mimic human hands. If you want to do more research, read this in-depth article about back massager cushions. My second advice to you looking for a Christmas gift is a neck massager. Don’t count this one off just because it is supposed to only relieve neck pain. As you can see in this video of me demonstrating, a neck massager can be used very extensively throughout your whole body. A neck massager will also be the center of attention at any Christmas gathering, and I promise you that everyone wants to try it at least once. Both neck pain and back pain can be a real bother, and to find relief is something everyone suffering from this want. A neck massager is great for relieving neck pain but only works to a certain extent to prevent it. Of course, it’s great to keep the blood flow circulating around your neck, but having a proper posture is the ultimate cure for any kind of neck/back pain. My suggestion to you is the SUNLITLIFE Cordless Shiatsu Neck & Shoulder Massager, which you can buy from Amazon.com. This product has amazingly 12 kneading nodes, is cordless and have some kind of patented massaging capability. I don’t understand exactly what is patented, but my experience is that everything that is patented is good enough to claim a patent for. Something that differs this neck massager from others is that EVERY product, before hitting the market, is quality ensured by professionals and offers a 1-year money back guarantee. It has a nice velcro strap to free the user’s hands and one charge gives approximately 2 hours of active massaging. If you want more general or in-depth information about neck massagers, read this best neck massager article going deeper into the products different functions. A TENS Machine is more of a rehabilitation product than it is “fun” and “relaxing”. But the benefits and results of a TENS unit are not to be overlooked too fast. A TENS machine might be a “scary” gift to give away since this might be a product not so many people are familiar with. But with the right knowledge and the understanding of how to use it will make it a well thought and impressive gift! Whenever using a TENS Machine, two or four pads are placed over or at the perimeter of the injured area of the body. The unit then sends an electrical current, or an electrical pulse, from and to the pads whenever activated. This electrical pulse stimulates the release of the body’s own natural opioid pain-relieving chemicals. I will suggest the TechCare Massager Portable TENS Unit as it is a very reliable and easy navigated unit. This device offers not only back relief but can also cover and relieve pain for other areas of the body, including legs, arms, glutes, shoulders etc. It is a well-designed product, which operates via a touchscreen. It has 24 pre-programmed modes and comes with a 30-day trial period if it so happens that the receiver did not find it useful. If you want to know more about TENS Machines, I have written one full in-depth best tens machine article about general information as well as one where i go over the exact placement of your TENS machine’s electrode pads. You cannot have missed this phenomenon. This is a great product for anyone wishing to relieve some pain in the back or on other areas of the body where muscles seem sore or tight. Foam rollers come at a vast variety of shapes and forms, you can find smooth, but also extremely textured rollers, which are designed more to hit some specific groups of tissues. Some rollers are of high-density caliber while some are much softer. No matter all the different kinds of options, there is one foam roller that is way more popular than all of the others combined, and it is the TriggerPoint GRID Foam Roller. This foam rollers material is very durable, the overall quality seems really professional and it comes at a very reasonable price. The pattern and logo of this foam roller are highly recognizable and seem to work best for an overall use, as the reviews and popularity shows. The density is almost at its peak in this foam roller, but I think those are the best foam rollers anyway. This results in an amazing 500-pound capacity! NOTE: I would caution anyone to use this who suffer from any serious back pain or lower back pain, as it is only recommended for muscle tension relief, not to actually treat an injured back. Let’s roll up the price a bit. A massage chair is something everyone is accustomed to. But too many people associate them with expensive and large massage chairs that you can find on the airport, thinking that there would be no way to own one yourself. I cannot go into all the features of a massage chair in this article if you want to read more, check this full in-depth article on massage chairs out! I will, however, give you my two top suggestions, one a bit more expensive – The KAHUNA LM-6800, which is pretty much crushing it on the market and the Magic Union Power Lift Recliner Massage Chair which is a great and a bit cheaper alternative. It also blends in to your interior in a very neat and fashioned way. You can find both of the products on Amazon. Wow, this is a really awesome Christmas gift to consider! This is the “underdog” of back pain treatment but surprises anyone that tests them. The basic principle of how it works is quite simple. When the body is in an inverted position, the spine is decompressed. Gently stretched, the vertebrae have been separated which allows rehydration of your spine, reduces nerve pressure, realigns the spine and relaxes muscles. Numerous studies and years of practice performed many benefits of the inversion therapy and pain relief is one of them. If you want to do some more research on inversion tables and its different functions, visit this article which is going over everything you need in order to make your decision. However, since I have researched this for a long long time, the only thing you need to know is that pretty much every inversion table works the same, and if you want the highest quality one, go for the Teeter EP-960 Ltd. Inversion Table. It is a well-designed product which comes with three different angle presets. It is very adjustable and allows people from 4’8 to 6’6 inches tall to use it. It has a weight capacity up to 300 pounds. As always, here is a full in-depth best inversion table review about everything regarding inversion tables. I have had 3 different acupressure mats and the first one was actually a Christmas present. It’s important, however, that you try to figure out if the person you’re giving this to is “that type of person” if you understand what I mean. There are basically two camps, the ones that love it and the ones that won’t go near it. I am in the first group! I will recommend the acupressure mat I currently own and uses regularly, the Nayoya Acupressure Point Mat and Pillow Set. Nayoya makes the highest quality acupressure mats, and this one even comes with an awesome acupressure pillow, that works great for the neck! It can be bought over on Amazon. Do you want more information? Please click here for the best acupressure mats to get to the in-depth guide. Ever since I heard about weighted blankets, I fell in love with its benefits. It might not have that much to do with back pain, but for overall chronic pain or problems with sleep (Which a lot of people suffering from back pain has), it is a great and affordable product. The CALMFORTER Premium Weighted Blanket is the ”original” weighted blanket, and it is still the best one up to date in the opinion of maaany people. It also comes in pretty much any color. I actually have a whole article on the benefits of a weighted blanket, and one for the best weighted blankets you can find for anxiety. This is another “sleep” product, which can truly help during any cold nights, and since Christmas is usually a cold period in most states, I decided to include it in this list. The technology from the “old” heated mattress pads have really skyrocketed. The new brands are so much safer, energy-efficient and controllable. The sleep quality is highly intensified and the temperature is easy to control with this new design. The Sunbeam Quilted Heated Mattress Pad is the one I bought as a birthday gift to my mother (her birthday is 2th of January), and it was a huge success! Pretty much everyone expects to get health-related gifts from me by now. More information about heated mattress pads can be found here. Okay, another sleep-related product, but I couldn’t help realizing that these type of gifts are excellent as a Christmas present. You might have heard people mentioning “memory foam” and that increases sleeping quality, but few know what it is. Memory foam is first introduced by NASA and was used as extra cushioning for aircraft seats to reduce damages from crashes. Memory foam is made from a substance called viscoelastic, a polyurethane material that when it undergoes deformation, it shows both viscous and elastic properties. The viscosity and elasticity of memory foam make it slower to return to its original form after experiencing pressure compare to other foam types. Give the Brentwood Home Cypress Gel 13 Memory Foam Mattress a visit over at Amazon, or read this guide to the best memory foam mattresses if you want more information! Swedish – this is the most common and most widely practiced in clinics, spas, and gyms. This form of massage uses long, slow strokes which makes it great for balancing energy and relaxation as well as stress reduction. Trigger Point or Neuromuscular Therapy – here direct pressure is applied to specific sites where there is muscle pain or discomfort. Applying this pressure to trigger points releases the tension being held there. Deep Tissue – This is more focused on muscle knots, or adhesions, in the deeper layers of the muscles. It utilizes slower movements than Swedish massage to help release the muscle fibers. Thai – The best description I came across for this form of therapy was passive yoga, meaning the massage therapist moves and manipulates the body to stretch, most usually on the floor. Hot-Stone – As the name says, it uses hot stones by placing them on certain points of the body. The heat is to release tension more quickly so the massage therapist can work the muscles or uncomfortable areas sooner. This one does come with an extra warning to check with one’s primary care physician for those with high blood pressure, diabetes, heart disease or that take blood thinners. This is my own little contribution since I have had one of those for many years now and I absolutely LOVE IT! So buy one for yourself as well! 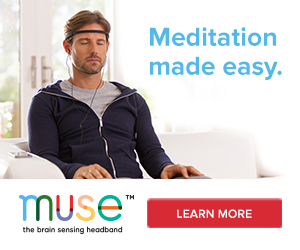 The first time I heard about the Muse Brain Scanning Headband was in 2016, and I believe it was at a seminar back in some health-coaching classes I was attending at the time. The Muse is described as an EEG neurofeedback device. Neurofeedback is a technique that has been used in the treatment of mental health condition with a purpose to alter brain functions by giving live feedback about the EEG rhythms in the brain. The goal is to decrease the theta activity (An electrical oscillation occurring in the human brain at a frequency of about 4 to 8 hertz) to an optimal level. A low theta activity is often a cause of anxiety, poor emotional awareness and stress while too much is typically the cause of ADHD, depression, hyperactivity, impulsivity, and inattentiveness. The optimal range of theta brainwaves frequency results in higher creativity, emotional connection, intuition, and relaxation. This is, of course, where we want to end up. If you know someone that is heavily into meditation and mindfulness, or someone that you know is really stressed out – please give my article on my Muse: 300-day story review of this device a read! I would suggest not buying anything that would infringe on the person’s self-esteem or something that clearly emphasizes that someone has a condition they are not very proud of. For example, a posture bracelet can be an indication that you find someone looking crouched and giving something to someone overweight that is intended for work out might not be very subtle. Also, consider if the person has chronic back pain – they have probably tried a lot of methods and tools and have probably figured out something that works for them already, so do your due diligence before buying anything to someone that they will find useless or offensive. Best of luck and have an awesome Christmas! !